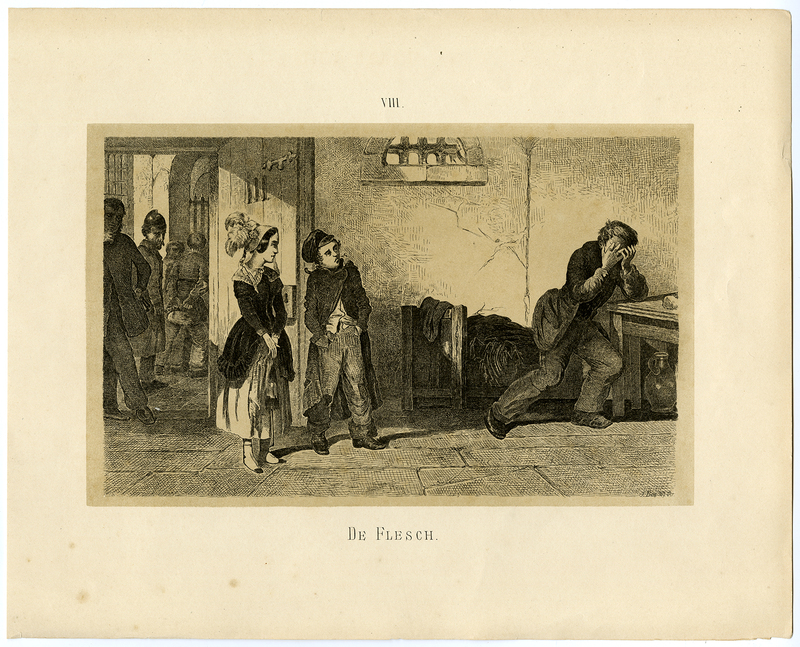 Subject: Antique print, titled: 'De Flesch, VIII' - A late 19th century satirical/moralising scene. A man is in jail for the murder of his wife in a drunken haze, his children visit him. Condition: Good, given age. Some stains in the lower margin. General age-related toning and/or occasional minor defects from handling. Please study scan carefully. Medium: Stone etching and tone lithograph printed from two stones on wove paper. Size (in cm): The overall size is ca. 35 x 26,5 cm. The image size is ca. 25,5 x 17,5 cm. Size (in inch): The overall size is ca. 13,8 x 10,4 inch. The image size is ca. 10 x 6,9 inch. Description: "De Gevolgen van het Drankgebruik, voorgesteld in acht steenetsen, naar de oorspronkelijke gravuren van G. Cruikshank", Utrecht: J. Bos Wzn., 1891. Stone etching is an intaglio technique in which a lithographic stone was etched with an image. This is a transitional technique between etching and lithography and was not utilised for a long period. The tone was printed from a regular lithographic stone. Artists and Engravers: Made by an anonymous engraver after 'George Cruikshank'. George Cruikshank (1792-1878) was a British caricature artist and book illustrator. During his lifetime he was hailed as the "modern Hogarth". The book illustrations he made for his friend Charles Dickens and many other authors reached an international audience.